My Life, Starting Up: Goodbye, Good Riddance Wells Fargo. I Hate You! 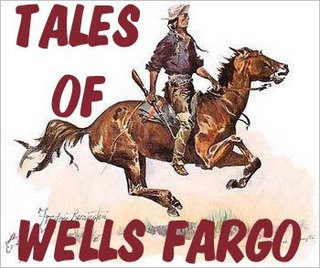 I know there are a few Wells Fargo employees who read my blog. To you, I apologize for what's coming. I'm sure your departments at Wells are run and managed like well oiled machines. It's just personal/business banking I'm not too fond of. It is with absolute joy that I walked into Wells Fargo yesterday to close my personal accounts. While I closed my business accounts weeks ago, I needed to get my new ATM and pin before I closed my personal accounts. I mean, how else could I overdraw my account if I didn't have an ATM card? It was actually a little sad. That marketing ploy they put on your ATM or credit card that says "Member since" really works. I've been a Wells Fargo member since 1995. That was my first year of college. My first real bank account. And that was back when I was living in Rochester, New York. A hellhole, but that's besides the point. It was a long time as a loyal customer. Wells has made thousands from me...if not more. And apparently it wasn't worth it to keep me around during these tumultuous last two years while I get my business going. And for a few mere $12 fees. I still can't get over how ridiculous they were in dealing with me. Absolutely no flexibility. No support for startups or entrepreneurs or loyal customers. And they're a damn San Francisco bank. Home of the startup. Anyway. It really was a pleasure in the end. "I'm here to close my account". Shazaaaaaam! I was thinking. They probably didn't care. But I did. And then I marched that bank check over to my new bank where I was met with open arms. And a smile. I hate Wells Fargo too. I am a Veteran and tried to covert my accounts to a Veteran's account. But, they would not do it without me closing my existing accounts and "applying" for a new account. I have a perfect credit score and have been a customer there for 25 plus years. This is how they treat a long term customer and a Veteran. I'm done with them and I hope everyone else is also. Since I have zero trust in this bank by now, I called a few days before the payment was to be automatically withdrawn from my checking account. I was assured that everything was in place and this time the payment would be made, thus officially starting the trial phase of the program. I never expected the problem that occurred. As a result of them going through the application process multiple times in addition to setting up and then deleting my payment schedule multiple times, there was some confusion as to the exact amount to be paid monthly. It was only a $12 difference, so I told them that I didn’t care which amount they were going to withdraw, I just wanted it set up. I was assured by more than one person that everything was set up properly. Much to my shock and dismay, they made 2 withdrawals on the same day, one for each of the different amounts. This caused my account to be overdrawn by hundreds of dollars. I called immediately to get them to fix this blatant error and was told that there was nothing that they could do about it. At first they wouldn’t even admit to the error. Eventually after several phone calls they admitted the error but still refused to correct it. They suggested that I just forget about it and maybe it could be credited for the following month’s payment. If I could afford to do that, I would not have needed this program and the headaches associated with 7 months of jumping through their ridiculous hoops. I had recently mailed several checks that to pay bills, none of which has cleared yet. I told WF that waiting another month to reconcile what was clearly their error was not an option. I am now in jeopardy of having all of my utilities shut off. I was told repeatedly that there was nothing that they could do about it. My account is now frozen with a negative balance. Several calls and more than 24 hours later, I was told that yes, they did make a mistake and yes they would refund the money but it would take 7 – 10 days for this to happen. I spent my birthday at home in tears. I have no money for food, gas, medical care or to pay my utilities. Wells Fargo knows this and does not care. I am very ill (this prolonged illness and related medical expenses is the reason for needing this program). The stress of this situation has had a significant impact on my health but now I can’t even afford the gas to go to the doctor or to pay for my medication. If you are persistent enough to badger then into letting you into this program, whatever you do, don’t trust them with automatic withdrawals. They will likely wipe out whatever money you have in your checking account and it will take a lot of effort on your part to get it back. If you are a lawyer and are looking for a good case, please contact me. It is definitely lawsuit time. The Home Affordable Program is really a great idea, but unfortunately some banks that are claiming to participate are just giving people a big hassle and hoping that they will just give up their house – especially those like me with a lot of equity. Hi appreciated your inside on Wells Fargo, and I used your image on my website. I wrote an article about Wells Fargo feel free to check it out at www.greendreamhomesinc.com Thanks again take care. HELLS FARGO BANK IS THE BEST AT FORCING PRODUCTS ON A CONSUMER THEY DON'T NEED. IN SWF THEY HAVE BECOME A MAJOR JOKE NOT A MAJOR BANK. Gaming at Wells Fargo is required by managers ans dist manager JB. Wells Fargo forces it's employees to lie and cheat. I worked for them for years and trust me it's not over. I am doing a tell all book with 60 managers, DM's and employees named in it worked in FLORIDA, I just wanted to reach out to you lol. I agree Wells Fargo Bank always pushes products you don't need. And when I said no about a credit card it still showed up at my house. I called the manager and stated I declined the offer for the credit card; he stated the banker made a mistake.